In an exhibition that marks the artist's first solo show in Boston, Soprafina Gallery is proud to present recent abstract paintings by Marc Van Cauwenbergh. Inspired by the human body in motion, in particular as expressed in dance and performance art, Van Cauwenbergh's compositions translate as abstract renditions of physical presence. Assembled in multiple intricate layers Van Cauwenbergh's loosely figurative forms seem to interact, generating a strong notion of sensuality and even eroticism. Made of thin washes of oil paint that are brushed directly onto the canvas, each subject manifests as atmospheric color construct. Combining deep-sea-blues with lemon greens, dazzling reds, with fleshy pinks, subdued browns, or charcoal black, Van Cauwenbergh's multifaceted palette determines each work's unique sense of rhythm and mood, ranging from harmonious and meditative to unsettling and darkly mysterious. With a strong sense for theatrical drama, Van Cauwenbergh succeeds in establishing a sophisticated visual language that radiates with poetic dynamism. Van Cauwenbergh states: "It is almost as though the overall present, vertical and monumental architecture of the city has been replaced by silent, anonymous humanoid forms, whose individual characteristics are reflected in their presence." Marc Van Cauwenbergh was born in Belgium and lives in New York City since 1994. He has exhibited in galleries throughout the United States and Europe. 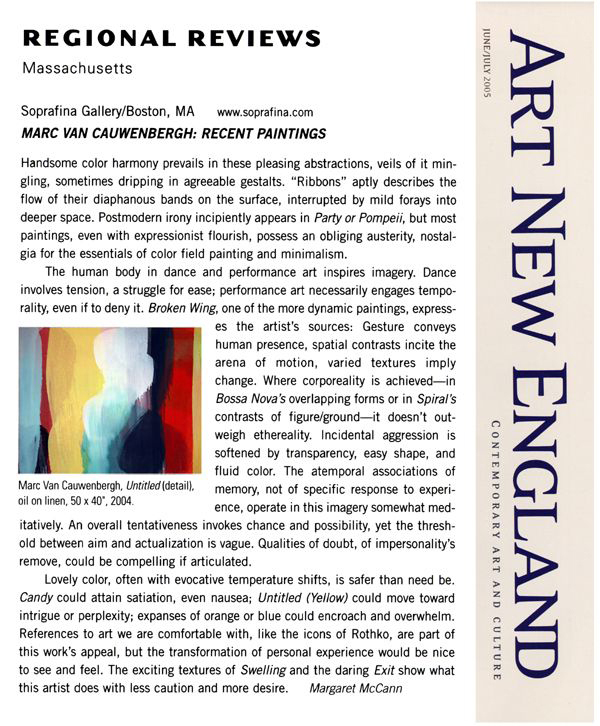 For more information, please contact the gallery at 617-728-0770.